The Lemoine-Mitchell Performing Arts Center is holding a fundraiser to support the auditorium at Saugus High School named in memory of two of its beloved teachers. 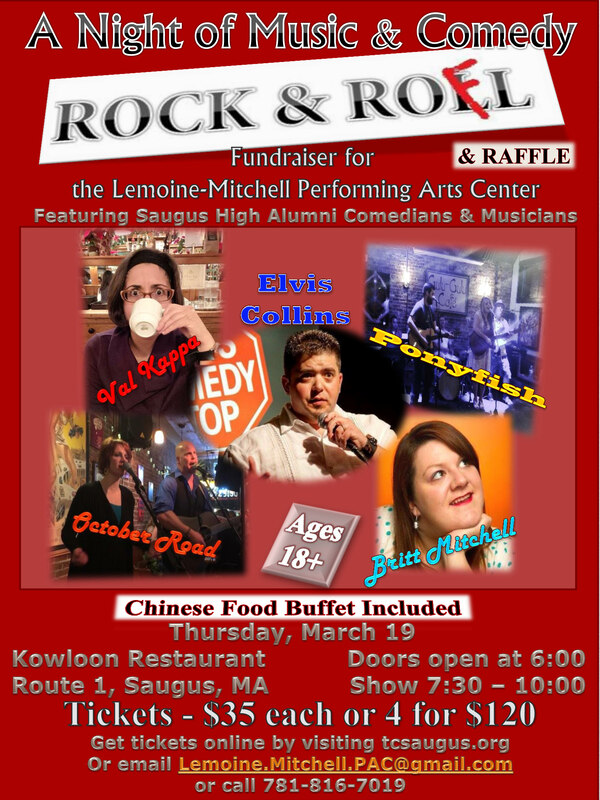 A Night of Music & Comedy: ROCK & ROFL, featuring comedians and musicians who are alumni of Saugus High School! The lineup includes comedians Val Kappa, Elvis Collins, and Britt Mitchell, and bands Ponyfish and October Road. Thursday 19 March 2015, from 7:30 to 10:00 PM. At Kowloon restaurant, on Route 1 northbound in Saugus, Massachusetts. Doors open at 6:00 PM. Tickets are $35 each. Or four for only $120. The price includes both a Chinese food buffet and the entertainment. Tickets may be purchased in advance online with a credit card, via the Nan Through The Years entity, and TicketStage, our online ticketing agency. Click here for online ticket sales. Tickets may also be sold at the door, with cash or check only. Nancy Lemoine was the drama teacher, and Jerome Mitchell was the band teacher at Saugus High School. Both taught for many years, inspiring generations of students, and left a legacy of many talented performing alumni. Come see them perform, and support the installation of new signage for the performing arts center named in their honor.